Ho, ho, ho – Santa’s almost here! With Christmas just around the corner, you’re probably starting to decorate for holidays. As you do, however, it’s important to keep in mind some of the potential holiday hazards for your four-legged family members. Let’s take a look at some tricks and tips to help prepare your home and your dog for the holiday season. For starters, your Christmas tree can be a giant danger. Dogs can reach up and try to grab ball shaped ornaments off the tree that they may think are toys. If this happens and the ornament breaks, it could lead to broken glass either in your dog’s mouth or on the floor – not a good situation in either case! An overactive tail could also knock ornaments off the tree and cause them to break. Avoid an emergency vet visit during the holidays by placing ornaments higher in the tree, well out of reach of your pup, and keeping a close eye on him or her whenever they’re near the tree. Tinsel is also a large danger. Shiny and sparkly, tinsel can catch your dog’s attention and, if ingested, could lead to intestinal blockages. Beyond that, tinsel can even cause serious problems within the intestines, causing the digestive tract to be stopped up or cut by the decoration. Keep tinsel on the tree and where your dog can’t get to it. Christmas tree lights are another major decoration of the season, but the wires are also something to careful with. 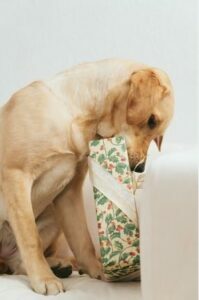 Labradors can be inquisitive or enjoy chewing on things they shouldn’t, and if left to their own devices, they may leave themselves to your devices – phone chargers, television power supplies and, yes, Christmas tree lighting cords. If your dog chews on wires, they could be shocked, leading to anything from a brief shock to even death. On top of that, a frayed and chewed cord is a serious fire hazard. Be mindful with how you connect your power cords and keep your dog and your home safe. Holiday plants are also a cause for concern. Holly, mistletoe and poinsettias are popular decorations for the holidays, but can be quite poisonous if enough has been ingested. It is important to keep these plants up on a high shelf away from your beloved pet. Candles are also a holiday danger. Most people love the smell and appearance of candles in the window, especially in the festive season. However, a wagging tail can easily knock over a candle and start a fire. It’s better to be safe than sorry, so make sure that – like your plants – your candles are supervised and out of your dog’s reach. At KT British Labs, our retriever puppies are not only great for retrieving downed game, but they also make wonderful family companions. With such sweet and loving personalities, you would be foolish not to add one of our dogs in your family. We also have started puppies, allowing you to choose a pup that is already obedient and housebroken, making the transition to your home even easier. Are you interested in adding one of our British Labrador retrievers to your family? Give us a call today at 218-685-5103 to learn more about our currently available and upcoming puppies.